A networked running project by kanarinka. How do you measure fear in a society obsessed with security and preparedness? This Spring, kanarinka is running the entire evacuation route system in Boston, MA, and measuring its distance in breaths. While running, she amplifies and broadcasts each breath into the public space around her body. The project is an attempt to measure our post-9/11 collective fear in the individual breaths that it takes to traverse these new geographies of insecurity. The $827,500 Boston emergency evacuation system was installed in 2006 to demonstrate the city's preparedness for evacuating people in snowstorms, hurricanes, infrastructure failures, fires and/or terrorist attacks. It takes 154,000 breaths to evacuate Boston consists of a series of running performances in public space (2007), a web podcast of breaths (2007), and a gallery installation of the archive of breaths (2008). 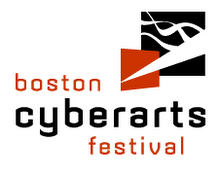 The performances and website are presented by iKatun for the 2007 Boston Cyberarts Festival. Thanks to the generous support of: iKatun, The RISD Professional Development Fund, The LEF Foundation, and the Boston Cyberarts Festival.